As Winx's phenomenal career draws to a close, we count down the finest horses to have raced in Australia this century. This weekend, Australian racing will lose one of its best thoroughbreds of all time to retirement. With the curtain about to be called on Winx’s career, it’s timely to look back on the past 20 years of Australian horse racing and choose the top performers throughout the past two decades. The criteria started out with Australian-trained horses only, but then I realised that would exclude two of my favourites in Dundeel and Sunline. So the list ended up being the best 20 horses in the past 20 years to have honed their craft on Australian soil. And it had to be for more than just one or two runs. No doubt there are some unlucky horses to be excluded from this top 20. It wasn’t until I started putting names down I realised how tough a job it was. Of course, you will have your own lists, so please feel free to throw them up for discussion. This superlative sprinting mare made her debut on a rock-hard track at Pinjarra in Western Australia and went on to win nine of her 13 starts in the west before being sent to Melbourne. She failed to fire in her first two starts in the big smoke, but found her best form again after being transferred to Freedman’s care. She won first-up for her new trainer and won her next three, capped off by the Group 1 Manikato Stakes at Moonee Valley. Miss Andretti went on to win another three Group 1 races in Melbourne – the Lightning, the Australian Stakes and the Newmarket Handicap, carrying 56kg. Freedman then took her to the UK, where she won the Group 2 Kings Stand Stakes at Royal Ascot before getting rolled on a soft track in the Group 1 Golden Jubilee at the same venue. She returned to Melbourne in the spring with two wins, including a Group 1 at Flemington, beating the talented Gold Edition. She again ventured overseas – this time for the Hong Kong Sprint – but was beaten by a long way as a $4.50 chance. She would race just twice more back home. Most memorable for the white patch on his face, this chestnut gelding was a serious sprinter. He won almost half of his 43 races and finished in the placings three-quarters of the time. A cat only by name. Of Apache Cat’s 19 wins, eight were at Group 1 level, four were in Group 2s, four were Group 3s and two were at Listed level. The Greg Eurell-trained gelding showed promise as a youngster and won plenty of races, including a blistering win in the Group 1 Australian Guineas over 1600 metres. 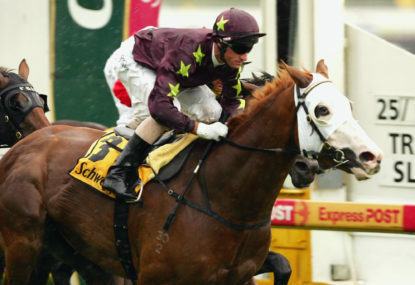 It wasn’t until he turned five that he became a Group 1 sprinter, scoring in the Lightning at Flemington in 2008. Once the drought broke, the heavens really opened. That would be the first of five consecutive wins, all at the elite level. Apache Cat won the Australia Stakes, TJ Smith, BTC Cup and Doomben 10,000 in succession. His form fluctuated from there, but he would win another two Group 1s and finish his career with a crack in the Hong Kong Sprint, finishing seventh. Although he will be remembered as a star sprinter, he won over a mile at Group 2 level and finished seventh in a Cox Plate. Eurell wasted some of his golden years trying to make him into a horse that he simply wasn’t. Thankfully, he worked it out. When this filly made her debut in a two-year-old race at Rosehill in 2009, ‘they knew’. Sensationally sent out as the $1.35 favourite, Nash Rawiller didn’t need the whip when steering More Joyous to a five-length win. When this filly made her debut in a two-year-old race at Rosehill in 2009, ‘they knew’. She was sent out the same price in her next start, but the punters didn’t get a collect after the saddle slipped and she failed to finish. But she ended up repaying the punters plenty over the next few years, winning 12 of her 15 starts from ages three to four. Her only blemishes in her four-year-old year were in two of the toughest races in the country, the Cox Plate and the Doncaster. Talented in Melbourne but a class above in Sydney, she kept racking up the wins until she was retired after a disappointing run in the 2012 Cox Plate, the same race that made headlines when Gai Waterhouse picked a wide barrier for the John Singleton-owned runner. She was no Sunline or Winx, but she was a special mare. There are perhaps more talented horses who didn’t make this list, but very few were as tough and resilient as Buffering. The popular Queenslander was never a favourite of mine as he seemed to lose when I was on him and win when I’d jump off, but nevertheless, he was a star. Buffering won five of his first six races and went on to compete strongly at Group 1 level as a three-year-old. But up against the likes of Black Caviar, Hay List and Sepoy, it took him 18 starts at the top level to break the Group 1 drought. Buffering’s win in the Manikato of 2013 would be the first of seven Group 1 victories, including a win in the Al Quoz Sprint in Dubai. Had he been able to avoid Black Caviar and Hay List, there’s every chance Buffering would be higher on the list. The only knock on his career was that he failed to deliver a Group 1 victory in front of his adoring Brisbane fans. Different judges would have her off the list or higher up the list, depending on how much weight you put on her 11 career starts. But one of the best horses I’ve ever seen, Frankel, only hit the track 14 times. Atlantic Jewel would have retired undefeated if she didn’t run into another freak of a horse, Dundeel, who we’ll get to shortly. A supremely talented middle-distance horse with a devastating turn of foot, it was a shame we didn’t see Atlantic Jewel in the Cox Plate, a race she would have almost certainly won. But injury problems ran in her family and she was worth plenty as a broodmare, hence the decision to retire her young. Find a replay of her Group 1 Caulfield Stakes win and enjoy the show. A Winx-like performance. Once again a victim of the breeders, this brilliant colt was retired far too early from a racing purist point of view. The Kiwi could have been the best since Phar Lap. His autumn as a three-year-old was the best I’ve seen. He won Sydney’s Triple Crown, blitzing rivals in the Randwick Guineas, Rosehill Guineas and ATC Derby. His 6.8-length win in the Rosehill Guineas remains one of the best victories produced in that historic race. Sadly, he became somewhat of a bookies’ pal from there, losing as a $1.28 shot in the Queen Elizabeth Stakes in 2013. As a four-year-old, he won just two of his six races but was redeemed in his final race start when he avenged his loss in the Queen Elizabeth, beating a strong field. Dundeel could have been the best since Phar Lap. He was then sent to the breeding barn, when we had yet to see the best of him. Amazingly, the Kiwis saw him race just once in New Zealand – on debut at Ellerslie. Horses don’t do what Fields of Omagh did. When he ventured onto the track for the last time, he was nine years old and won the Cox Plate. His victory that day made it two career wins in the WFA championship. Over his lengthy career, ‘FOO’ competed in Australia’s best race on five occasions for two wins, a second, a third and a fifth. He was a true warrior of the turf. 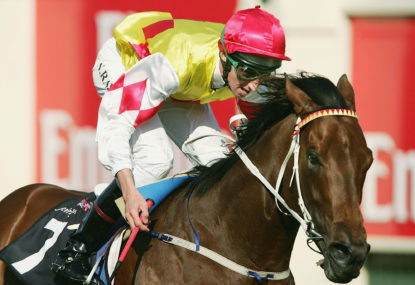 Between his Cox Plate wins in 2003 and 2006, the David Hayes-trained gelding won just two of his 19 starts, but kept on collecting cheque after cheque for connections. He travelled to Hong Kong, Japan and Dubai, but failed to fire overseas. While there are classier horses around, his longevity and ability to win Cox Plates against the likes of Lonhro and El Segundo have him rated highly in my book. When Karasi made his race debut, John Howard was the Prime Minister, the Adelaide Crows had yet to win back-to-back premierships and I was still in primary school. Karasi raced nine times in the UK for Sir Michael Stoate before making his way to Australia. He would have a further 88 starts in his career and win 13 times in a period dating from 1999 to 2008, leaving a lasting legacy. A talented horse over the flat in his youth, Karasi won the Geelong Cup in 2001 and ran fourth in the Melbourne Cup the following month. After a lean patch of form for David Hall, he was sent to master jumps trainer Eric Musgrove to be schooled over the sticks. The Irish-bred gelding ran third in a maiden hurdle at Mornington in 2003 and took three attempts to break his jumping maiden, winning at Morphettville. It was the start of grand things to come. By 2005, he had become a formidable hurdler and steeplechaser and he was sent to Japan. He would go on to win the Nakayama Grand Jump – the richest jumps race in the world – three years in a row and was only denied a fourth when he injured a tendon in the lead-up to the Grand Jump in 2008. Had he raced, Karasi would have been 13 years old. While many will argue a steeplechaser doesn’t belong on this list, Karasi was simply a pro. A worthy entrant in the Australian Racing Hall of Fame. There’s only one horse on this list that opened their career with a maiden win at Swan Hill, but that shouldn’t take the shine off his achievements. Elvstroem was a mighty horse. It took him four starts to crack a victory in the city and seven to register a Group 1 win. But he became the pride of Melbourne when he saluted in the 2003 Victoria Derby at Flemington. I still remember cheering him on with my $10 invested. (Photo by Mark Dadswell/Getty Images). His three-year-old autumn failed to reach great heights, with just one win from eight starts, but he was always thereabouts. Elvstroem ran third in the Australian Cup and wasn’t far off in the AJC Derby when sent out a $21 shot. Trainer Tony Vasil proved the son of Danehill had class when, in the spring of 2004, he had Elvstroem win three in a row – the Underwood, Turnbull and then the Caulfield Cup. The ding-dong battle between Elvstroem and Makybe Diva in the 2004 Caulfield Cup remains etched in my memory. The following year, Vasil took him to Dubai, where he won the Dubai Duty Free Stakes, before heading to Hong Kong and the UK. Elvstroem raced four times in the northern hemisphere, three times in England and once in France. He failed to win there, but didn’t finish further back than fourth in each of those races. He would never race in Australia again, instead standing at stud. Probably my favourite horse outside of Winx, this beautiful beast of a gelding was cut down by injury in his prime. At his best, he was breathtaking. Unseen as a two-year-old, Weekend Hussler made a slow start to his racing career, losing on debut at Sale before a maiden win at Cranbourne. But once he won, he didn’t stop. Over his next 13 starts, he triumphed on 11 occasions. Among those wins included victories in the Caulfield Guineas, Coolmore Stud Stakes, Oakleigh Plate, Newmarket Handicap, Randwick Guineas, George Ryder Stakes and the Underwood. Sadly, he was pushed further up in distance to 2000 metres and 2400 metres in the Caulfield Cup. While it was not his undoing, the horse failed to return to his best. Injuries kept him from finding his best and Weekend Hussler was eventually retired three years after hitting his peak. A gem of a racehorse. I had difficulty placing this horse and many will probably say he doesn’t deserve to be in the same company as some of the other 19 horses, but here we are. Although somewhat of a bridesmaid as a two-year-old, Choisir did win a couple of nice black-type races. He ran third in the Golden Slipper and the Champagne Stakes. Once he was three, he turned a corner. My favourite Choisir moment came in the Lightning Stakes when Glen Boss decided to be a hero and ride him solo on the outside of the straight. Usually considered racing suicide to go it alone down the Flemington straight, Choisir was simply too good for his rivals who chose the outside fence. He couldn’t back it up in the Newmarket, but was sent to the UK, where he won twice from three attempts. He won the King’s Stand Stakes over 1000 metres at Ascot then backed it up with victory in the Golden Jubilee at the same track over 1200 metres. His only defeat in England came when he was rolled as the favourite in the July Cup at Newmarket. Sadly, we never got to see him race again. He was sent to stud and is still servicing mares at $30,000 a pop. It’s easy to remember Chautauqua for being a barrier rogue and a horse that failed to win in nine of his final ten races, but that would be forgetting one of the best sprinters to grace the turf in the past two decades. At his best, there was no better horse to watch. There were more consistent sprinters and I’m sure many will argue this grey gazelle is placed too high in the rankings, but Chautauqua is one of the most talented thoroughbreds to have raced in my lifetime. Three consecutive wins in the TJ Smith Stakes confirm his ability. His victories in the Lightning and Manikato back it up. He even went to Hong Kong and blitzed them from the back of the field. Without a doubt, his best and most memorable win was in the 2017 TJ Smith when he defied all logic to produce an unlikely victory. Chautauqua was so far back that he made Kingston Town look like a sure thing when Bill Collins famously declared he couldn’t win. Dead last at the 400 metres to go sign on a bog Sydney track, Tommy Berry weaved his magic to come from the clouds and win. To put it simply, that’s why Chautauqua made the list. There are plenty of talented horses and plenty of stars, but only the very best could do what this enigmatic gelding did that day. It was freakish. Do yourself a favour and watch the replay. The story of Takeover Target seems so far fetched that even Hollywood scriptwriters would baulk at the fairytale. Yet all of it was true. This champion thoroughbred is the greatest rags-to-riches tale in Australian racing history. Purchased by Queanbeyan taxi driver and horse trainer Joe Janiak for $1250 in 2003, Takeover Target went on to win more than $6 million in stakes. That’s only part of the story. Most horses race when they are two, but some are held back until they are three. In Takeover Target’s case, he didn’t make his race debut until he was four after battling leg and joint problems as a youngster. The gelding debuted at his home track in April 2004 and, by October, had won seven races in a row. The last, a victory in the Group 1 Salinger Stakes at Flemington, would be the first of eight victories at the elite level. My most memorable Takeover Target moment was the start prior to the Salinger, at the northern NSW track of Grafton. There were plenty willing to write off the new whiz kid of racing in the Ramornie Handicap that day. He was well up in class, had drawn the car park and was trained by a virtual nobody. That day, he turned heads with a blistering win that Grafton locals still describe as the best they’ve seen. There were some hiccups after his early success, but Takeover Target’s love of the Flemington straight came to the fore in the summer of 2006 as he racked up wins in the Group 1 Lightning and Newmarket Handicap. Janiak then embarked on an overseas venture, which resulted in wins at Royal Ascot and in Japan. The horse known as ‘Archie’ saluted in the Doomben 10,000 in 2007 and made another trip to the UK, finishing second in the Golden Jubilee. In 2008, he won the Krisflyer Sprint in Singapore and made another assault on English rivals. In his two starts in the UK, he ran second and fourth. Janiak came home via Western Australia and added the Winterbottom Stakes to his resume in December, followed by a win in the TJ Smith at Randwick in the autumn. To cap off his career, Takeover Target’s last win came in The Goodwood at Morphettville on May 2, 2009. He’s the only horse to have won an elite sprint race in each major Australian racing jurisdiction as well as overseas. Hollywood should have come knocking. I’m putting it on the line here. It was unavoidable. At some point, I was going to get to the ‘big three’ of Northerly, Lonhro and Sunline and have to rank them. What can’t be argued is all three were giants of the turf. They did more for racing over a five-year period than any individual person has done in the history of the sport. Seeing them race was a privilege in itself. But, here’s why Northerly came in third place. It boils down to his overall winning record. The Fighting Tiger would rank first in toughness, but Sunline and Lonhro had him marginally covered for talent. That’s no knock on the brilliant West Australian though. Northerly won back-to-back Cox Plates, achieved the rare Caulfield Cup-Cox Plate double in the same spring and won two Australian Cups – one of which was in record time. He was a marvel. One of my favourites. If you ever wanted a horse to fight for your life, there’s only one horse that would come to mind. 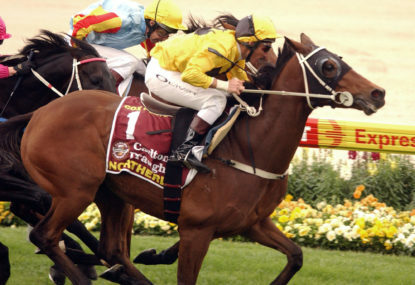 Northerly’s undoubtedly the best horse to come from Western Australia and there have been many stars over the years. I’m a hypocrite, I know. I rate the Cox Plate as the best race in Australia and the toughest to win, yet I have Lonhro here at number six, ahead of horses like Northerly and Fields of Omagh. But I’ll make an exception and note that Lonhro simply didn’t handle Moonee Valley. The track was his kryptonite. He was better than his rivals in the 2002 rendition, where he finished sixth behind Northerly and he was better than his rivals in 2003, where he finished third behind Fields of Omagh. But the mighty son of Octagonal simply hated The Valley. If he liked it there, I have no doubt he would have won multiple Cox Plates and made a case to be a top three horse on this list. If you remove his starts at that track (which I love, for the record), Lonhro raced 33 times for 26 wins and four placings. As a middle-distance horse, Lonhro did it all. He won the Caulfield Guineas, the Australian Cup, the Orr Stakes, the George Ryder, the George Main, the Queen Elizabeth and the Mackinnon. All except the WS Cox Plate. History will judge him harshly as a result of his flops in Australia’s WFA championship, but I did my best to be kind to this modern marvel. Had he been allowed to continue his career in Australia, there’s no doubt So You Think would have been able to challenge the next four horses for a podium placing. He was a superlative colt. His two Cox Plate wins were breathtaking and he probably could have won five if he was allowed to stay. But the sensible decision was made to send him to the northern hemisphere so he could test his wares against the best over there and add to his breeding value. He didn’t disappoint, racing 11 times for Aidan O’Brien for six wins – five at Group 1 level – and two seconds. I’ve always said there’s one sure way to determine class in racing; put a horse in uncomfortable conditions and see how they handle the challenge. It might be a heavy track or it might be over an unsuitable distance, but the classy horses tend to prevail. So You Think proved his class in the 2010 Melbourne Cup when he ran third behind Americain. There’s not an ounce of staying ability in So You Think, but he beat 21 rivals nonetheless. Vulnerable at any distance past ten furlongs, So You Think also managed to run fourth in the 2400-metre Prix de l’Arc de Triomphe, Europe’s finest race. It was a shame for Australian racing that Coolmoore took So You Think from Bart and sent him to the other side of the world, but you only need to revisit some of the colt’s highlights to remember how special he was. Before Makybe Diva, Black Caviar and Winx, this mare was known as “the mare”. She was a pioneer. In the history of Australian racing, no mare had done what she managed to. People my age (I was born in 1987) take great mares for granted. We’ve seen so many stars in the past two decades. But before Sunline, they were a rare commodity. She raced 48 times for 32 wins and 12 placings. She missed a place just four times in her career. Four times. That’s freakish for a horse that travelled from New Zealand to Australia, back to New Zealand, back to Australia, then over to Hong Kong as well as Dubai. She won back-to-back Cox Plates in 1999 and 2000, won from 1100 metres to 2040 metres and did it all while creating the pace in the majority of her races. Sunline was as tough as nails. In the spring, summer and autumn of 2000-01, Sunline raced 11 times in four countries and won on eight occasions with three placings. Freak. Most horses are turned out for a spell after winning a Cox Plate. They might have one more run at the most. Not Sunline. Trevor McKee sent her back to Pukekohe after her Cox Plate victory for the Group 2 Breeders Stakes over 1400m. Then it was back on the plane for the Hong Kong Mile. Another win. Sunline headed back to New Zealand to triumph in the Waikato Sprint at Te Rapa and then was back to Australia to salute in the Apollo Stakes. From Warwick Farm, she left for the UAE and managed to run third in the Dubai Duty Free Stakes. Amazingly, connections were not done yet, returning her to Australia to run in the All Aged Stakes at Randwick. A tired Sunline ran third that day before earning a spell. Having her fourth on this list seems harsh to me, but if I was compiling a list of the best ten horses in Australasian racing history, all four would feature. A remarkable era. Not much needs to be said about Makybe Diva other than that she will be remembered as one of the great staying horses in Australian history. If her three Melbourne Cups didn’t stand her out, try adding a Cox Plate, a Turnbull Stakes, a BMW, a Memsie and an Australian Cup. If Lee Freedman wanted her to win a particular race, she would do it. In her first Melbourne Cup, it’s fair to say history doesn’t look back generously on her rivals. She beat a pretty slow field that day. But 12 months later she had to face a star-studded line-up that included Irish St Leger champion Vinnie Roe, Caulfield Cup winners Mummify and Elvstroem, Mamool from the Godolphin stable, and the 2002 Cup champion Media Puzzle. A year after that, the Diva had to avoid all handicap races and instead dominated at WFA level, winning the Turnbull and Cox Plate, before trying to attempt history and win a hat-trick of Cups. Carrying 58kg on a track that had a touch of sting out of it at Freedman’s request, Makybe Diva was remarkably $4.40 to win that day. In hindsight, in the era of ‘Black Caviar odds’, it was stealing money. Ridden a peach by Glen Boss, the brilliant mare created history and was subsequently retired a champion. The only knock on her career was her failure to win overseas, having been sent to Japan for two starts between Cups two and three. But she’ll remain a legend of Australian racing regardless. It’s incredibly harsh to have a horse that raced 25 times for 25 wins in second place, but this is the only time Black Caviar hasn’t finished first. The only reason I have her behind Winx is because of versatility. In Black Caviar’s career, she raced over three distances – 1000 metres, 1200 metres and 1400 metres. The 1400-metre attempt happened just once. That is not a knock on Peter Moody or Black Caviar’s connections. When you have the world’s best sprinter at your disposal, it doesn’t make much sense to put her up in distance. This is the only time Black Caviar hasn’t finished first. But I would have loved to see her tested at a mile against some class middle distance horses. I think she would have beaten all comers. As I wrote about So You Think, class rises to the top in racing and Black Caviar had oodles of it. In her decorated career, she won the Newmarket Handicap, the Lightning Stakes (now named the Black Caviar Lightning after she won it three times), the TJ Smith, the VRC Sprint, the BTC Cup and The Goodwood, to name a few. Dealing with public pressure, Moody then put her on a plane to England where she raced in front of Queen Elizabeth II to win the Diamond Jubilee Stakes at Royal Ascot. While all of the eight aforementioned horses on this list had a legion of fans, Black Caviar changed the game. She was the first horse since Phar Lap to capture the attention of the entire Australian public. The Melbourne Cup is the race that stops a nation, but Black Caviar was the horse that stopped it. I’ll never see a better sprinter in my time. I’ve been a little bit cheeky here and given Winx 37 wins from 43 starts with an added $2.32 million in prizemoney. Let’s be honest, her chances of winning her final race in the Queen Elizabeth Stakes are as sure as the sun coming up tomorrow. That’s because I’m convinced that Winx is not only the best horse to have raced in Australia over the past 20 years, but she is also our greatest horse of all time. In the history of racing, no horse has accomplished what she has been able to achieve. She was not bombproof as a filly. Very few are. But once Winx learnt how to be a racehorse, she was unbeatable. What gives her the tick for me is that she’s been incredibly versatile. Winx has won over 1100, 1200, 1300, 1400, 1500, 1600, 2000 and 2200 metres. In her only attempt at 2400 metres, she finished second. 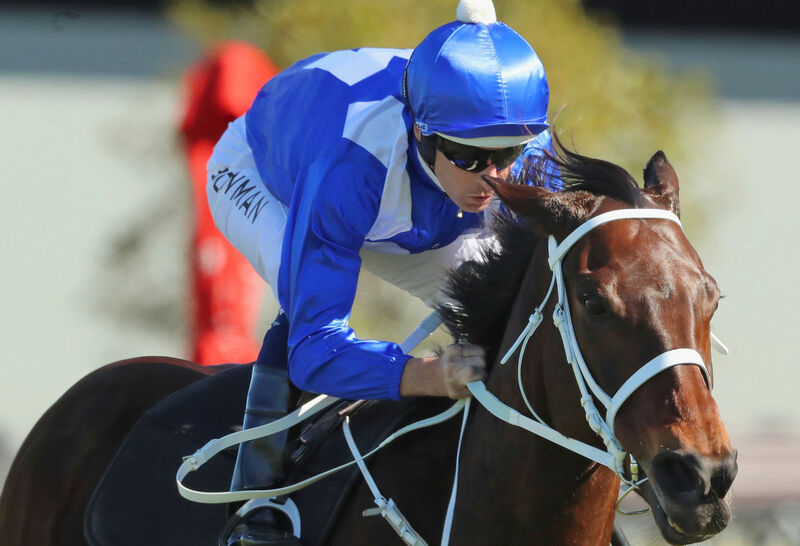 There has been the odd stayer and middle-distance horse to win over the shorter distances, especially early in their campaigns, but for Winx to be able to do so consistently over her career is unheard of. In her streak of 32 wins in a row, opposition trainers and jockeys have tried their best to beat her. They’ve tried running races at a quick tempo, knowing Winx gets back early. They’ve tried going slow from the start, knowing that she relies on having one sustained sprint in the final 400m. But none of those tactics have proven detrimental to the Chris Waller-trained champion. In her current form, which has lasted the best part of four years, she is unbeatable. In that time she’s won four consecutive Cox Plates, four consecutive Chipping Norton Stakes, four consecutive George Ryder Stakes and is about to add a third straight Queen Elizabeth Stakes. If Waller set her for a Melbourne Cup, she’d be classy enough to win. If he wanted her to win The Everest, she could do that, too. Racing will be poorer for her loss when she retires next Saturday. There’s no doubt Winx is the best I’ve ever seen. Matt is a newspaper editor by trade but spends his time dwelling about his glory years as an average opening batsman and slow half-back flanker. If he’s not flicking between all the sport he can find on TV, he’s out trying to lower his handicap on the golf course. He loves writing about horse racing – one of the most intriguing industries in the world. Image Credit: All images are Copyright Getty Images unless otherwise stated.